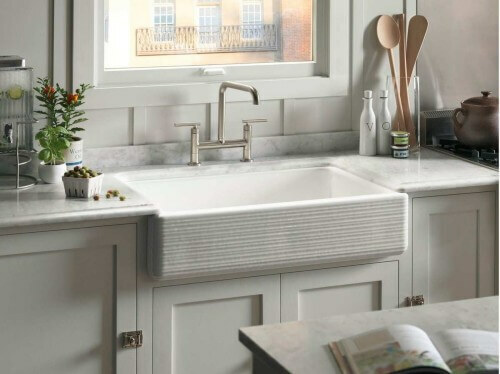 Here are the top kitchen sinks that boast great style, functionality and durability. You may be surprised by the impact the right sink can have on the look and functionality of one of your home’s most vital rooms. Whether you’re a sucker for science or just want to take design cues from the brainiacs of the world, soapstone is the go-to choice for laboratory sinks and countertops. Because this stone is naturally resistant to staining and bacterial growth and is non-reactive, it offers a host of benefits for kitchens. 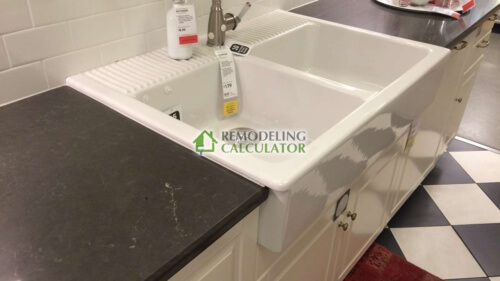 Certainly a high-end option, a soapstone sink has a price tag to match. Starting costs will typically be around $1,000, going up from there depending on a wide range of factors. – Over time, it will develop a patina, which can be a drawback for homeowners who want an unchanging surface. Hands down, one of the best sink materials is stainless steel. Resistant to both heat and stains, a stainless steel kitchen sink offers a surprising number of finish and style options. It is also available at different price points to suit any budget. 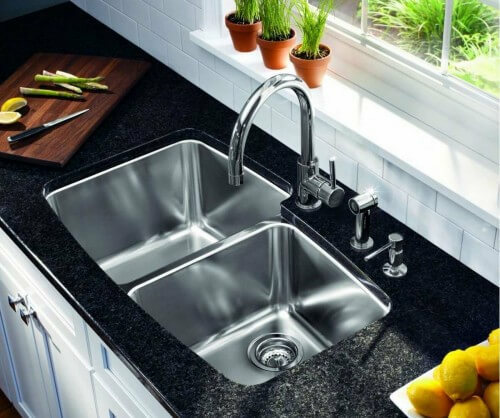 The gauge, or thickness of material you choose for a stainless steel sink will be a deciding factor in the total price. Sink sizing and how its mounted will also come into play. Be prepared to spend anywhere from $100, all the way up to $600. Enameled cast iron should earn a spot near the top of your short-list if you want to add a vintage flair to your kitchen. Still, it’s not just for retro throwback kitchens anymore. These days, iron alloy sinks coated with enamel are available in a wide range of colors and styles. The broad price range of enameled cast iron means it can suit a variety of budgets. In most cases, it will cost somewhere between $300 and $900. – Seamlessly pairs form with function as a beautiful option which doesn’t require a sacrifice in terms of durability. – Due to weight and difficulty of handling, installation can be more involved for an enameled cast iron sink. When you want the look of granite but aren’t wild about the price point, a composite granite sink may be your best choice. 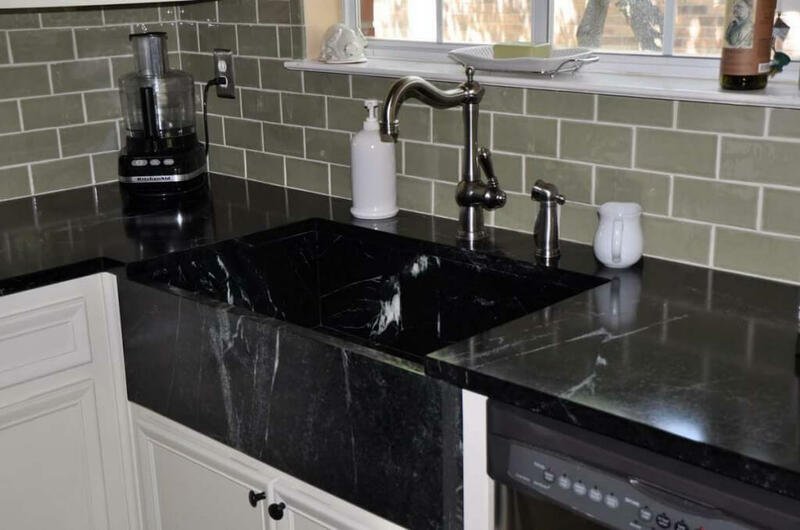 Offering exceptional durability, composite granite is a man-made sink material capable of mimicking the look of granite beautifully, since it contains a substantial amount of genuine granite stone. The price point is somewhere along the middle of the spectrum. This makes it ideal for kitchen remodels with a moderate budget, since typical costs range between $250 and $550. Fireclay is one of the least known types of sinks. 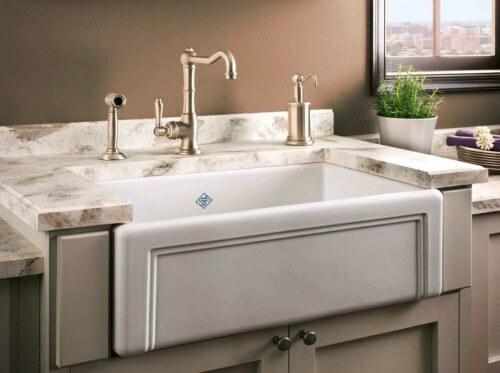 It offers solid character, ideal for people who love farmhouse style sinks. If you’re in the market for a heavy, practically indestructible kitchen sink, fireclay fits the bill. Made of clay fired at temperatures of over 1,800F, fireclay sinks are then coated with a special glaze for even more durability. 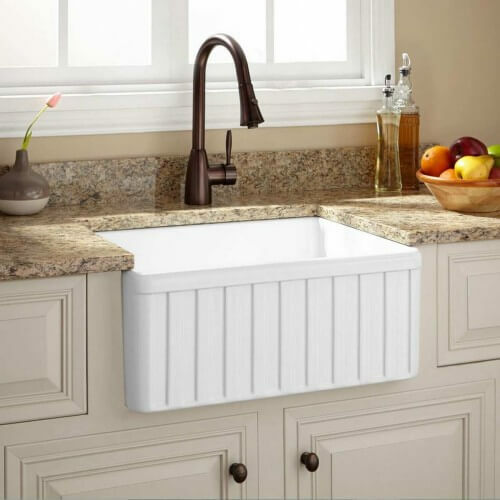 You should look to spend anywhere from $450 to $1,000 on your new fireclay kitchen sink. – Faucet options may be limited to wall-mounted or counter-mounted choices. Have you decided on quartz countertops for your kitchen? If so, and you’re interested in creating continuity with your kitchen sink, a quartz option might be your best bet. 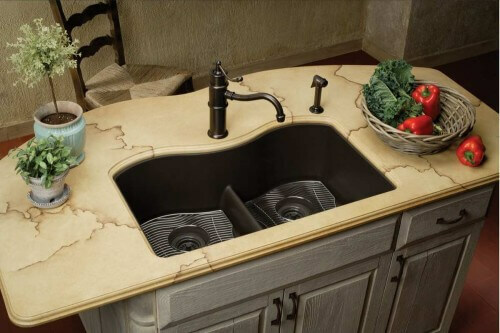 On the higher end of the price spectrum, a quartz kitchen sink will usually cost between $800 and $1,200 installed. When you want the same continuous look offered by quartz or natural stone but aren’t wild about those materials, solid surface countertops and sinks are another option. The cost of solid state countertops usually starts at around $50 per square foot installed, with increases in pricing to fabricate and install a matching sink. One of the higher-end materials on our list is copper. When you want a sink with superior visual interest and durability, copper just might be the way to go. This living surface will develop a patina and colors will evolve over time, providing unparalleled character. 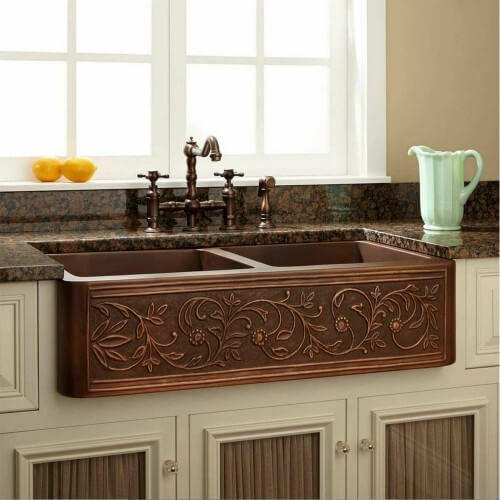 Depending on your specifications, copper sinks can run anywhere from $500 up to $1,200. Prices increase with heavier gauges and added customization. – Ease of shaping makes copper a versatile option in terms of style and fabrication. Similar to enameled cast iron, porcelain sinks are coated after fabrication with a baked-on porcelain finish. Porcelain has been used in sink and bathtub applications for more than a century. This option spans the price spectrum, you can expect to pay as little as $250 for a porcelain sink, or as much as $2,000. IKEA DOMSJO Farmhouse Sink is a great example of inexpensive (~ $315 US), yet beautiful and very practical ceramic sink that can be installed in most kitchen cabinets (even non-IKEA cabinets) and make your kitchen very unique. This is a true example of quality on the budget – something you cannot say about many other IKEA products! – Classic styling makes porcelain an ideal fit in farmhouse, rustic and country kitchens. – Like other heavy kitchen sink materials, porcelain will often require extra stabilization of base cabinetry to accommodate the weight. – Porcelain is somewhat susceptible to scratches, which can lead to rusting of the underlying metal. 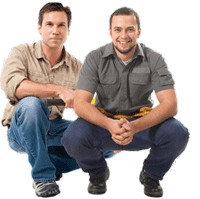 – Chipping is a concern if objects are dropped from significant height onto a porcelain surface. In the end, choosing the right material for your space means balancing a number of factors. You should look for an option which suits your décor, needs and budget, tying together your personal space. Remember, there’s no one-size-fits-all option; your kitchen, and the right sink for the room, is as unique as you are. Kitchen Remodeling Ideas – get inspired with these original kitchen designs and start remodeling! Remodeling Costs Guide for 2018 – if the kitchen is not the only project on your plate, check out our complete prices guide to different renovation, remodeling and construction projects around the house. Wood And Marble Kitchen Island – can these two materials play nice together? You be the judge. 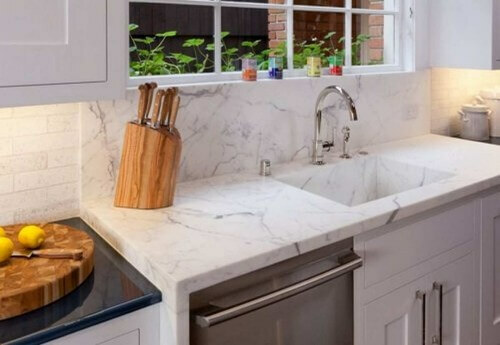 I would like to have the price of the quartz countertop with integrated sink in what looks like marble. Personally, I’m a big fan of ceramic sinks with a drainer. It looks delicate, but it’s mega-durable and easy to clean. I’ve had a ceramic sink in my kitchen for the past few years now, and I haven’t had any problems; when it’s cleaned up, it looks as good as new. Granite is a good alternative but looks very modern, so it depends on the style of your kitchen. 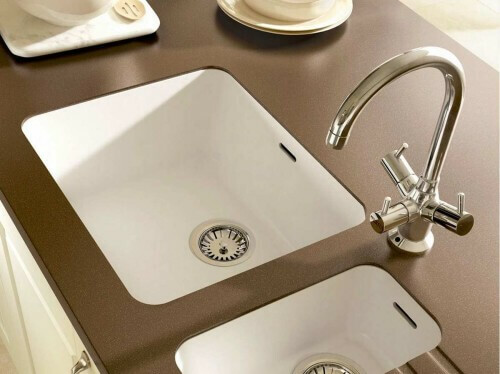 Can you please tell me where the picture of the integrated quartz sink comes from? Thank You.